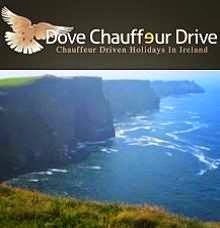 HOLIDAYS in IRELAND: Chauffeurdriven tours of West and South West of Ireland's Wild Atlantic Way. Chauffeurdriven tours of West and South West of Ireland's Wild Atlantic Way. Last night we attended a great show in Killarney, featuring Irish dancing, music, and song, and we all enjoyed it very much. The group, Celtic Steps, perform at the Killarney Racecourse normally, but as there was a race meeting there today , last night's show was held in the Malton Hotel. This group perform right through the season, and i would highly recommend it. Baby Harper, showing off her patriotic side with her shamrock on full display. Today, we left Killarney behind, as we made our way to Galway city. Here we have the group, pictured in the centre of Galway city, where i left them to explore this historic town. From the left we have, Tim, Nikki, and Chris. Harper was in her buggy at this stage, having a rest.